Chino Hills Cosmetic Dentist, Cosmetic Dentistry | Dental Care of Chino Hills > Dental Care > What is Sleep Apnea? What is Sleep Apnea? It is a disorder that prevents the body from getting enough oxygen during sleep which causes the body to stop breathing during sleep. Loud snoring can be a potential sign of this condition. Some other symptoms are memory loss, headaches, & depression. Commonly found in patients that may be older and overweight- this disorder does not discriminate and can also affect men and women of any age and body type. If left untreated this can lead to a variety of serious medical conditions (i.e hypertension, stroke, heart attack & potentially sudden death during sleep). So what are your options in treating this disorder you may ask? There is an appliance commonly used by dentist that helps keep the airways open during sleep. This appliance is similar to a night- guard and is only worn during sleep. 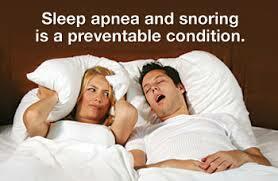 Its helps minimize and potentially eliminate Sleep Apnea symptoms. There are other more evasive treatments like surgery but every case is different. Please call Dental Care of Chino hills if you feel you may be suffering from this disorder. – Blog post by Adriana Lopez DA.